← Last voyage of the Princess Alice. Urban Myths no. 4: Spring Heeled Jack. Posted: July 16, 2014 | Author: thelondoncolumn | Filed under: Amusements, Tall Tales, Transport, Vanishings | Tags: Hendon Way, London folklore, Spring Heeled Jack, Tim Turnbull, Urban Myths |Comments Off on Urban Myths no. 4: Spring Heeled Jack. Spring Heeled Jack in Hendon. © Tim Turnbull 2014. Dean and Jeanette Jackson were returning from a night out celebrating their son’s Ricky’s birthday party when they saw a mysterious figure darting across the A41 just north of Hendon. * Not real news item. However, Spring Heeled Jack was an urban myth of the Victorian era. A mysterious dark figure reported to be responsible for a string of attacks in the 1800s and known for his ability to leap great heights, was first sighted in Wandsworth in 1837 and given the SHJ sobriquet by the penny dreadfuls of his (or its) day. 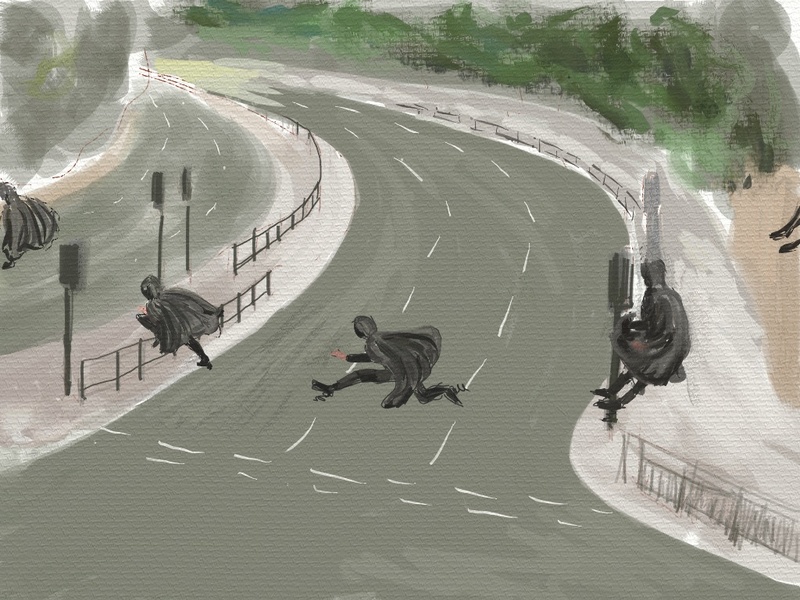 For further reading, see The Legend of Spring Heeled Jack. See also: The Supermarket Spider, Airport Caterpillars, The Discarded Artist’s Statement. Tim Turnbull’s poems have appeared in these pages before; this is the first time he has contributed as an illustrator. See: Clapham Common Clowns, Black Cab Blues, Frankie Howerd, Robert Graves, The Last Squat in Hackney.